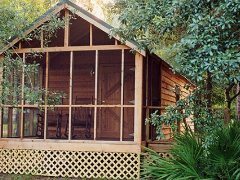 Rent a cabin and get your second night 50% off. One of the most beautiful birds of prey, striking in its shape, its pattern, and its extraordinarily graceful flight. Hanging motionless in the air, swooping and gliding, rolling upside down and then zooming high in the air with scarcely a motion of its wings, the Swallow-tailed Kite is a joy to watch. 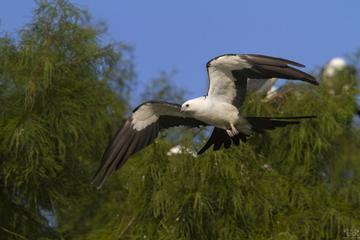 Highland Park Fish Camp is the closest access by water to one of the largest roost of Swallow-tailed Kite's in Florida. Take a 4 mile boat trip to their nesting area to witness hundreds of these beauitful birds in action. This package includes one night in our one bedroom cabin with a 3 hour guided tour with a coast gaurd licensed captain. This package includes two nights in our one bedroom cabin. A 3 hour guided tour with a coast gaurd licensed captain. 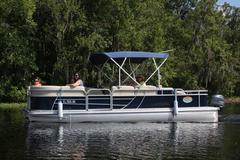 A full day rental of a pontoon boat for your own private self guided tour.